I'm only painting the clouds with sunshine." This week I started digging in the boxes of old 78s and fell in. The result is a show that's top-heavy with bakolite platters for the Victrola. We start out with a song I've loved since I was a kid growing up in New Jersey: "Powerhouse" by Raymond Scott. It was the theme song of the make-believe radio shows I'd invent in my room, so it makes a guest appearance as the opening theme here. 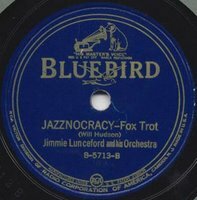 "Jazznocracy" by Jimmie Lunceford and his Orchestra comes next. I thought it had a nifty title, and you can't go wrong with Bluebird records. Very tasty - and it's the "B" side!!! 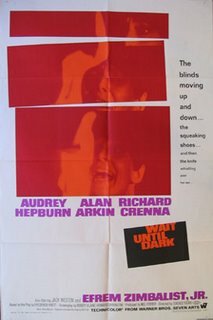 One of my mom's favorite radio shows was "The Shadow," and a listener asked if I could sneak in a taste of that great series, so I snuckthe open and close into the mix. 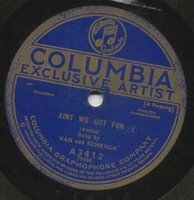 The most worn-out record I slapped on the turntable this week was "Ain't We Got Fun." Van and Schenck's recording popularized this 1921 nugget. I resisted the urge to follow one old nugget with another - instead of playing Johnny Marvin's rendition of "Tiptoe Through the Tulips With Me," I flipped the record over and played another song from the same long-lost musical ("Gold Diggers of Broadway") - "I'm Painting the Clouds with Sunshine." 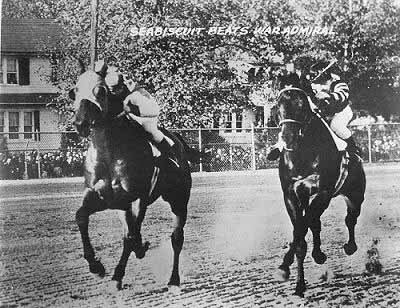 Then it's off to the racetrack to hear the immortal live call of the Pimlico Special, Nov. 1, 1938: Seabiscuit vs. War Admiral for the right to be called the greatest horse in the world. "I Don't Care If the Sun Don't Shine," which Elvis Presley later recorded as the "B" side of "Good Rockin' Tonight" for Sun records in 1954. Mr. Presley's version is a bit different from the tune crooned by Mr. Martin. 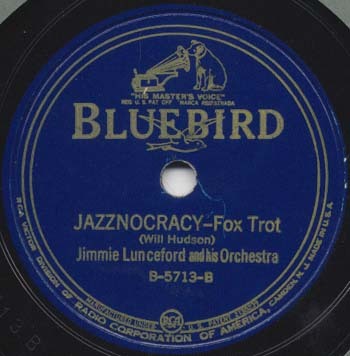 The "A" side of the record by Jimmie Lunceford and his Orchestra was called "White Heat," and it scorches the end of this week's show - tagged by the signature weekly conclusion of "The Shadow." This one's a little different from the first three - I'm trying not to settle into a "format" for the Attic. Next week's show will be closer to what you've heard before, and I have something special planned for #6 - so come back for more, please! I think you'll like it. Leave comments here or send me an e-mail. I like that White Heat. The Shadow was also one of my Mom's favorite radio shows. I prefer Nick Danger. I've not considered Alan Arkin or Richard Crenna to be very scary, but Audrey Hepburn ... Aaah, yes, Sabrina. I like visiting your attic. It goes well with "living in mine." Wow. Powerhouse sure was aptly named! I recognized the Bugs Bunny bits, but was a bit surprised that I don't consider that riff the best of the song. Again, kudos on a thoroughly enjoyable episode. 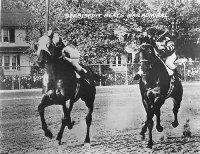 BTW, I do believe that was the legendary Clem McCarthy, one of the great sportscasters of the era, calling the Seabiscuit race.